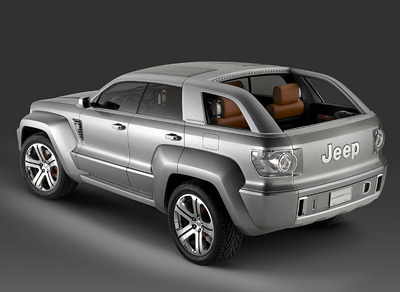 The Jeep Trailhawk concept revealed at the 2007 Detriot Auto Show was a vehicle which combines the off-road features of the new body-on-frame, four-door Jeep Wrangler Unlimited (which the Trailhawk is built on), with the refined on-road characteristics of a luxury car. 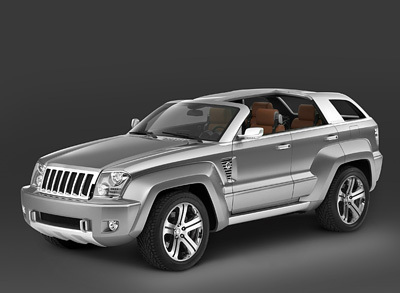 The distinctive and unusual proportions of the Jeep Trailhawk are due in part to the extra long 116 inch (294 cm) wheelbase and also the unusually low roofline and slanting A-pillars. The stance of the Jeep Trailhawk is broad, and the wheels, pushed to the corners of the vehicle, are enclosed in robust flares dramatically offset from the body. 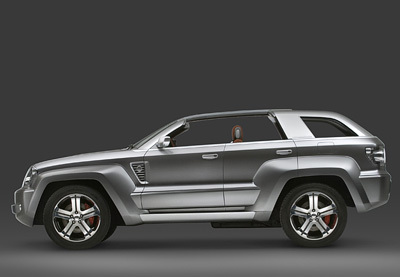 Partly trapezoidal in shape, yet not asymmetrical, these angular, crisply-contoured wheel flares reinterpret one of Jeep's fundamental design cues. "The flares are stretched and pulled taut at one end," Nick Vardis, principal exterior designer says. "Each presents a 'long side' angled toward the center of the body." The enormous arches of the Jeep Trailhawk help to cover the 22" wheels wrapped in on-road tires. The Trailhawk's upper structure is set onto the lower body, encased by a crisp, chamfered 360-degree molding that runs around the greenhouse, accenting the high, arching beltline. At the base of the windshield is a seven-slot cowl screen that reprises the grille. 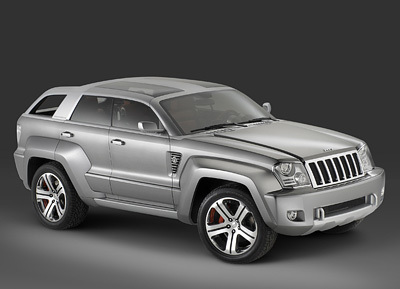 The Jeep Trailhawk's exterior is painted in Argent Pearl high-gloss, with the flares and lower body a slightly darker low-gloss variant. The side windows of the Jeep Trailhawk retract fully into the body, leaving no B-pillar above the belt, while the diagonal quarter windows are also fully retractable. Gray-tinted twin longitudinal glass panels over the first- and second-row seats and the glass panel over the cargo compartment are removable, as is the swing-up backlight. With all the glass lowered and removed, the Trailhawk offers occupants virtually the same open-air ambience as a typical soft top Jeep. The fixed central spine contains overhead lighting and several integrated storage bins. Power for the Jeep Trailhawk concept comes from a 3.0 litre BLUETEC diesel developing 215 horsepower and 376 ft-lbs of torque.